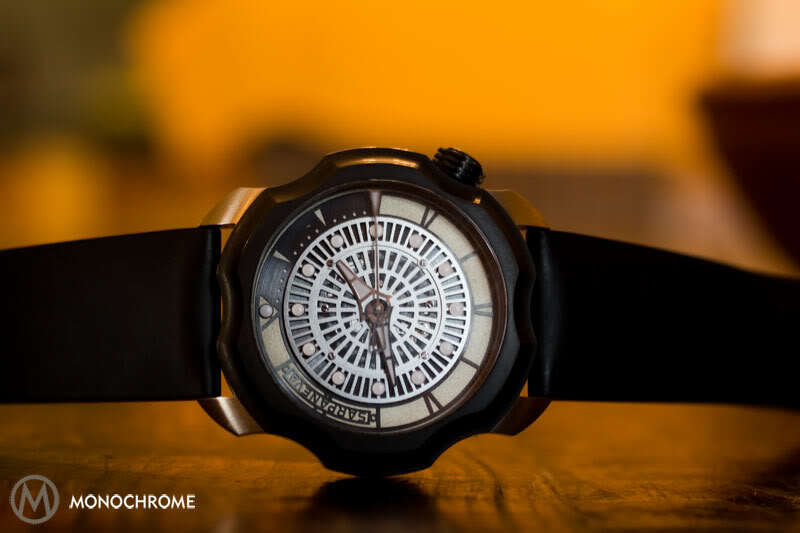 A dive watch from an independent watchmakers is something unusual. 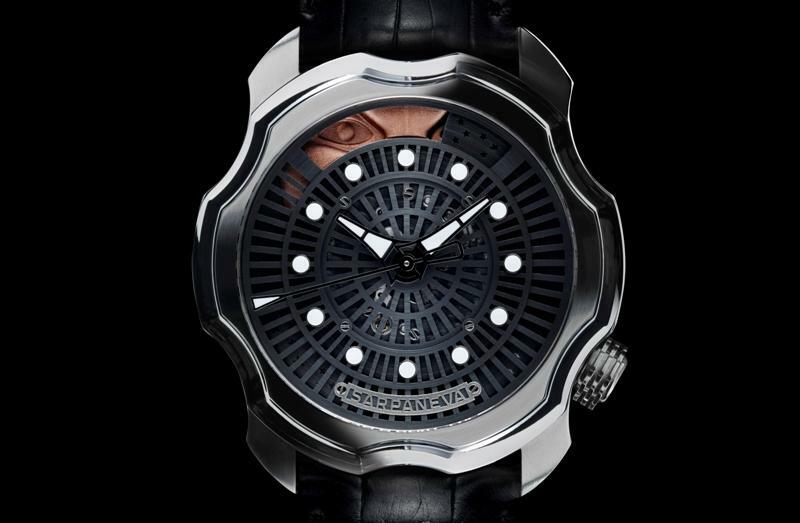 The extraordinary Finnish watchmaker Stepan Sarpaneva is not afraid of the unusual and releases his new dive watch, the Sarpaneva Korona K0. 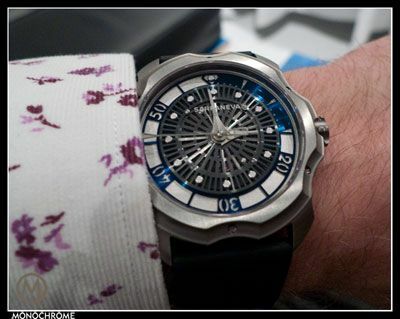 Sarpaneva showed me a prototype of his new dive watch during Baselworld. The size of the titanium case is 46mm and i assumed it would be a bit too big for my wrist. I was proven wrong when i put it on my wrist. The Korona K0 actually fits very well and comfortable! 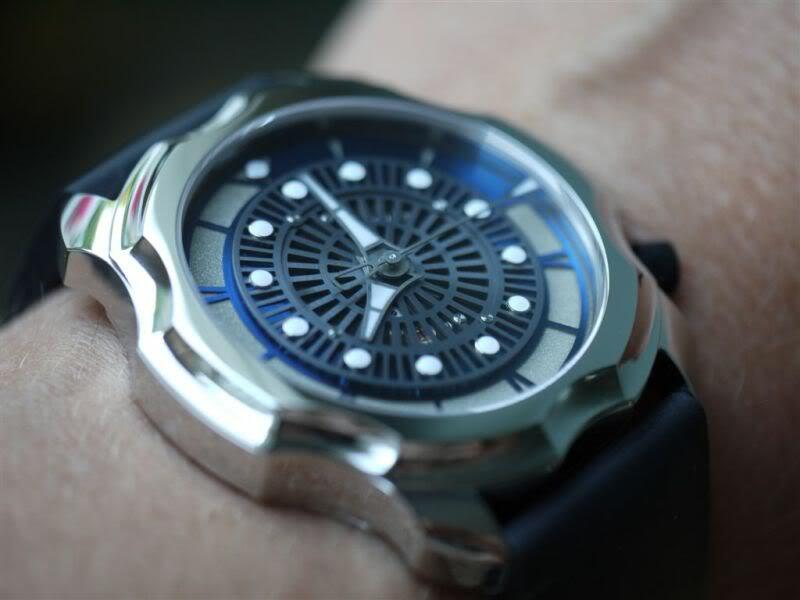 The new Sarpaneva Korona K0 does not look like the typical dive watch. 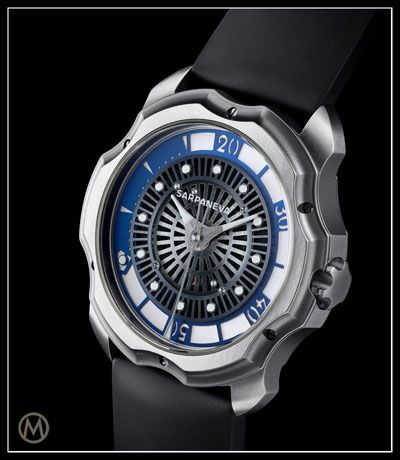 This high-end sports watch has a remarkable mechanism to operate the internal dive time ring. 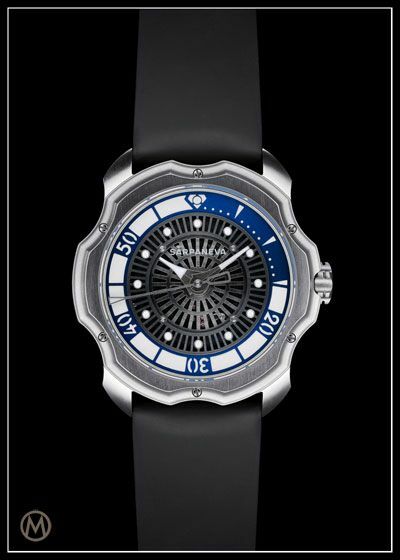 The dive time ring is in fact, directly integrated into the movement. 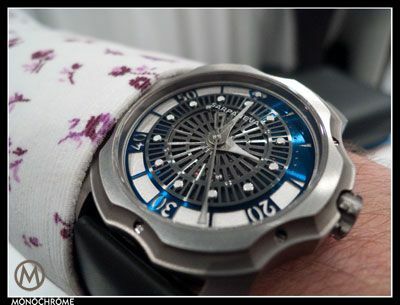 The movement’s mainplate is modified to incorporate the diver’s timer ring. This unique feature allows all functions to be set by using only one crown. Yes indeed… one crown to set the time and adjusting the internal dive timer ring. Now you never accidentally turn the dive ring during a dive! I already mentioned how comfortable the 46mm titanum case feels around the wrist, which is typical for Sarpaneva watches. 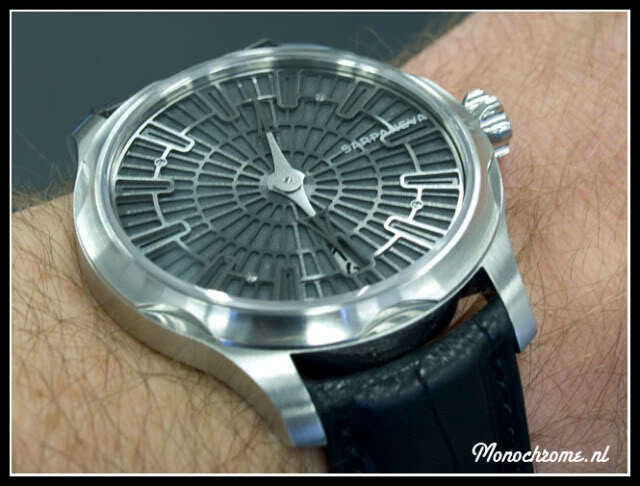 Also typical for Sarpaneva watches, is the case’s thickness. It measures only 10mm, which is also adds to the Korona K0 comfort and makes it very qualified for wearing with a long sleeve shirt. 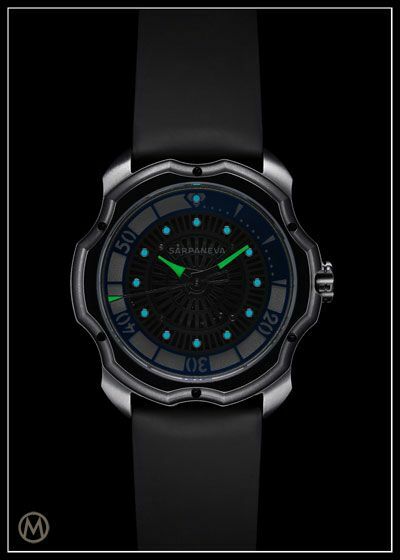 Even the Blancpain Fifty Fathom which features Blancpain’s ultra slim automatic movement, is 15.5mm thick. And this is a difference you will absolutely notice when wearing such a high-end dive sports watch with your suit. The 1.5 mm thick sapphire crystal has several layers of anti-reflection coating on the inside. This is to prevent the anti-reflection coating from getting scratched, something that unfortunately happens too often when the coating is also on the outside. The logo, SARPANEVA, is also printed on the inside of the crystal. One downside… you’ll have to wait until next year. 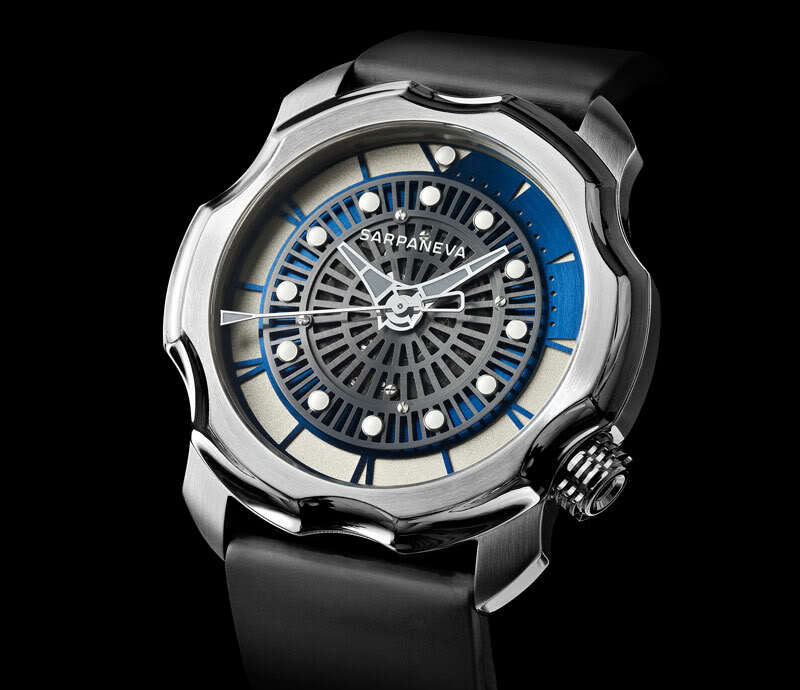 The Sarpaneva Korona K0 is available in 2011. For now, one more photo to enjoy this high-end dive watch. 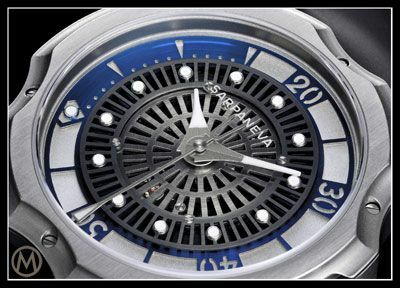 @Dive Watch… The Sarpaneva Korona K0 can go down to 200m or 660 feet, not like you say 330 feet. This is more than enough for recreational diving, because for this kind of dives you don’t submerge deeper than 30-40 meters. One of outstanding features is that it’s only 10mm thick! No idea which Breguet you mean, maybe you could specify?